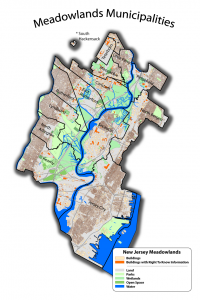 The New Jersey Meadowlands Commission (NJMC) is a regional planning agency encompassing 14 municipalities in Northern New Jersey. 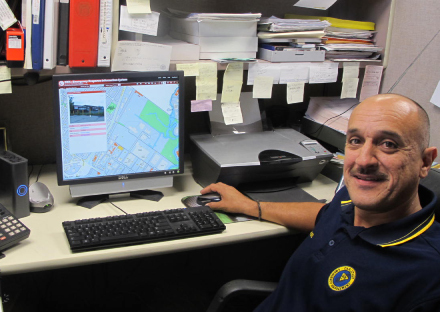 Through a centralized Geographical Information System (GIS) the agency provides information enabling emergency officials to ascertain critical information about an area prior to arriving or while at the scene of an emergency. This information is provided through a free, user-friendly, online application known as the Emergency Response Information System (ERIS). The ERIS system provides emergency response officials with access to a secure database in which detailed property-specific information is stored. 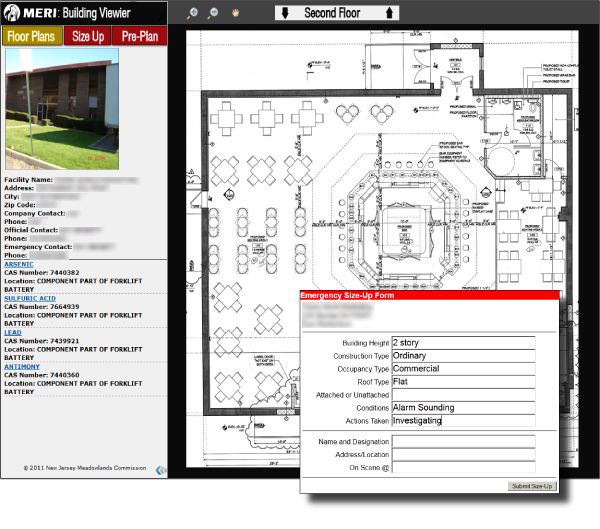 The latest addition to the ERIS application includes building footprints and their floor plans which add a visual representation to the existing information about each facility. This article outlines how emergency responders interact with the system, how the information is visualized, and how officials use the system to gauge an incident prior to or during an emergency. Various functions of the system have resulted from the direct feedback of emergency officials. The NJMC Municipal map can be viewed here: http://webmaps.njmeadowlands.gov/municipal/ however access to the ERIS features are restricted to emergency responders and OEM officials. 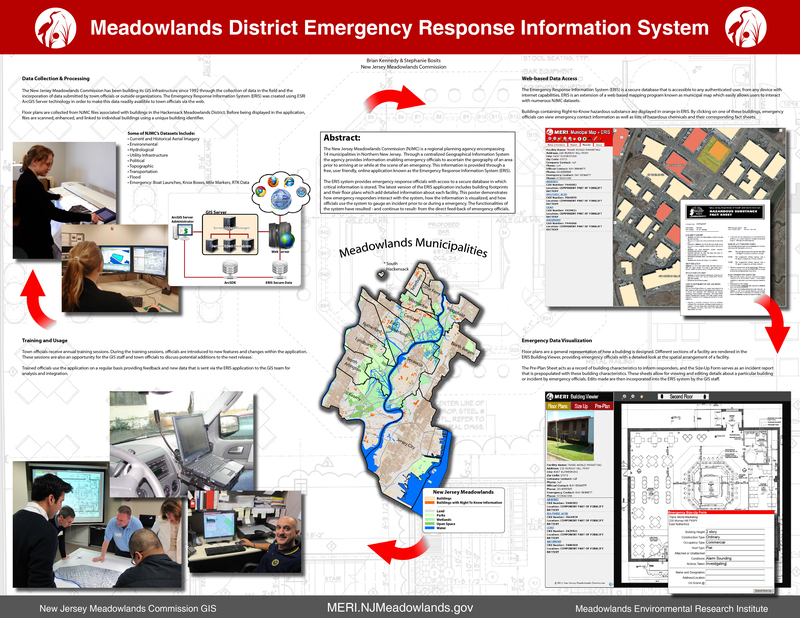 The New Jersey Meadowlands Commission has been building its GIS infrastructure since 1992 through the collection of data in the field and the incorporation of data submitted by town officials or outside organizations. The Emergency Response Information System (ERIS) was created using ESRI ArcGIS Server technology in order to make this data readily available to town officials via the web. 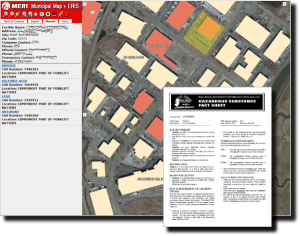 Floor plans are collected from NJMC files associated with buildings in the Hackensack Meadowlands District. 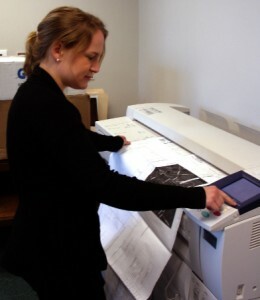 Before being displayed in the application, files are scanned, enhanced, and linked to individual buildings using a unique building identifier. 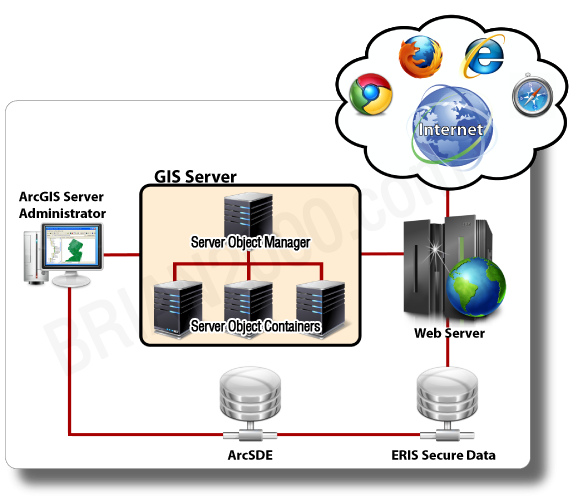 Using ESRI's ArcGIS Server, the Emergency Response Information System (ERIS) is a secure database that is accessible to any authenticated user, from any device with internet capabilities. ERIS is an extension of a web based mapping program known as municipal map which easily allows users to interact with numerous NJMC datasets. Buildings containing Right-to-Know hazardous substance are displayed in orange in ERIS. By clicking on one of these buildings, emergency officials can view emergency contact information as well as lists of hazardous chemicals and their corresponding fact sheets. 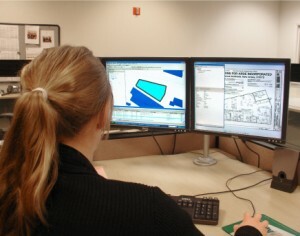 Floor plans are a general representation of how a building is designed. 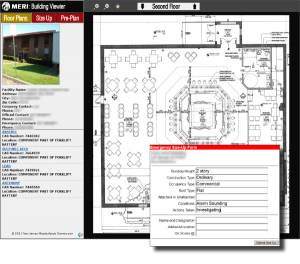 Different sections of a facility are rendered in the ERIS Building Viewer, providing emergency officials with a detailed look at the spatial arrangement of a facility. The Pre-Plan Sheet acts as a record of building characteristics to inform responders, and the Size-Up Form serves as an incident report that is pre-populated with these building characteristics. These sheets allow for viewing and editing details about a particular building or incident by emergency officials. Edits made are then incorporated into the ERIS system by the GIS staff. Town officials receive annual training sessions. During the training sessions, officials are introduced to new features and changes within the application. These sessions are also an opportunity for the GIS staff and town officials to discuss potential additions to the next release. 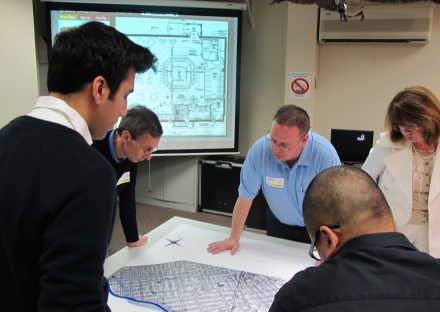 Trained officials use the application on a regular basis providing feedback and new data that is sent via the ERIS application to the GIS team for analysis and integration.